Shedding the Shadows is a tapestry woven out of discarded items of clothing donated by Lotus House, created to bring awareness of the transformation that occurs daily at this particular shelter, and countless others, wherein people shed their “homeless” personas through hard work and introspection to transition into a new period in their lives, one of completeness and fulfillment. This process is mimicked in the artwork: seemingly useless objects are repurposed into a series of ropes, with their connotation of strength and usefulness, and this compilation of new objects, created through hard work and introspection, is transformed into an object of beauty. In preparation for the weaving, the artist collects and starts preparation of the discarded items of clothing that will be transformed into ropes. These items must be sorted and washed, and cut and twisted into ropes. 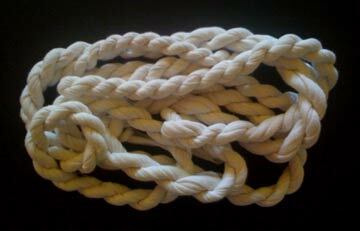 There will be sessions of “public” rope-making, where participants will collaborate in the creation of the ropes. These will be held at Lotus House, ArtCenter South Florida, and other locations to be determined. The tapestry will be exhibited in public locations throughout Miami-Dade County. Shedding the Shadows will offer a visually appealing and emotionally poignant way for the Miami-Dade County community at large to engage with the life-stories of people transitioning from homelessness, a group of people that is usually hidden, albeit in plain sight. Please click here to join my mailing list for project updates.